You might not be able to play football in the office or classroom, but you can probably get away with tossing around a paper football—its unique triangular alternative. And you can make a paper football right from your desk in just a minute without a pair of scissors. Just portion and fold your paper and then create your football by folding a series of small triangles together. Find an sheet of paper. Ideally, you should use a sheet of printer paper or tear out a piece of ordinary paper from your notebook. This is the best size of paper for a paper football, although if your paper is a bit smaller or larger it will still work. 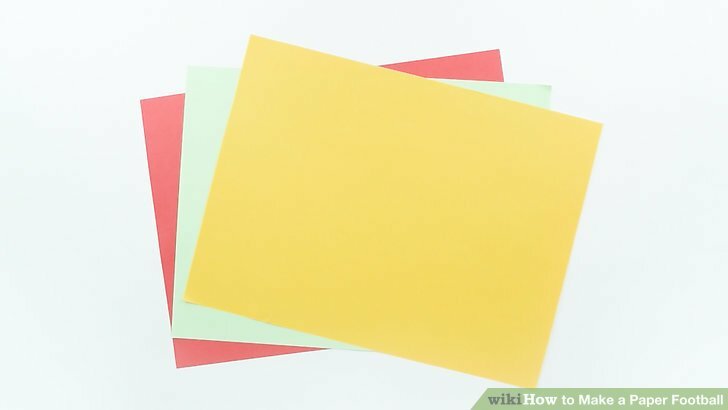 Notebook and printer paper works better than thicker paper or construction paper because they're easier to fold. They're also lighter and easier to use in a game of paper football. Use a fresh sheet of paper so the football looks nice. This will also make it easier for you to decorate it later if you'd like. Fold the paper in half lengthwise and then unfold it. Either fold the right side of the paper to the left, or the left side of the paper to the right. Make sure the edges of the paper match up so that you create a neat vertical crease down its center. Unfold the paper once you've made a defined crease. Pinch the crease with your thumb and index fingers and run them along it to make it more firm. To make the crease even firmer, you can unfold the 2 halves, turn the paper over, and fold them again. This will create a defined crease along both sides of the paper. Cut or tear the sheet along the vertical crease. Use scissors to cut along the vertical crease. You can also tear the paper in half by holding the left and right sides and gently pulling them in opposite directions. Either way, the end result should be 2 tall strips of paper that are wide and tall. You will only need to 1 strip to create 1 paper football. If you like, you can use the other to create another football later. Use scissors to cut your paper into 2 pieces whenever possible. Fold 1 of the strips in half lengthwise. Start by folding the top left corner about halfway down toward the bottom left corner. Afterwards, bring the top right corner down to the same halfway point toward the bottom right corner. Pull both corners down to their respective opposing corners. Press the crease down after lining up the corners. Place the half horizontally in front of you when you're finished—the piece should now be half as wide and twice as thick. Fold the lower right corner toward the opposite edge of the paper. This fold should form a triangle. The left side of the triangle should run parallel to the width of the horizontal paper. The top edge of the triangle should run perpendicular to the left side of the triangle. The left and top sides of the triangle should form a 90-degree angle, creating a right-angled triangle (the other two angles should be 45 degrees each). Flip the triangle toward the left side of the paper. Use the thumb and index finger of your right hand to grab the triangle by its top right corner. Hold down the bottom left corner of the triangle with your free hand as you begin to flip the triangle to the left. Move your fingers out of the way at the halfway point of the flip and create another thicker triangle. Press down on the top and right creases of the new triangle. Continue folding triangles along the paper until you've reached the end. Move toward the left side of the paper, pressing down on the creases of your new triangles as you go. Give the last creases a good rub once you're left with 1 triangle. Undo the last 2 folds of the paper. With the point of the triangle facing up, pull the first fold downward to make a square. Now, pull the second fold outward from the square. The end result should be a square (or rectangle) attached to a right-angled triangle. Fold the right-angled triangle downward. Afterwards, you should have 2 connected right-angled triangles that form a larger one. Don't worry if it's not a perfect triangle—it takes practice to get it right. Trim about off the outer point of the righthand triangle. With the tip of the paper facing downward, draw a line to mark off the corner piece. Use a pair of scissors to make a cut parallel to the height of the triangle (the line from the bottom corner straight upward). You can also tear off the extra paper with your hands. Another option is to fold the right tip of the triangle toward the height so you don't have to remove any paper. Tuck the right side of the new triangle into the pocket on the left. Hold the 2 outer sides of the left small triangle with your thumb and forefinger. Gently squeeze it to widen the opening. With the point of your paper facing downward, take the tip of the small triangle on the right and tuck it into the pocket that is created by the left. At the end of this step, your larger right-angled triangle (created from 2 smaller triangles) should now be the same size as the smaller ones but with double the thickness. Flatten the paper football with your fingers. Smooth down the creases of the triangle until you have a flat paper football. Now that it's ready, you can start being a champion paper football player. Decorate the paper football if you want to get creative. If you'd like to give your paper football a personalized touch, use a marker or pen to draw stitch marks and other defining features of a football. Brown markers make a great color for football leather, and white or gray works well for the stitches. To make a second football, repeat this process using the remaining half of your paper. Always use scissors when you can—you'll get better creases and smoother throws when playing games of paper football. To make a thicker football, don't rip the paper in half after folding it lengthwise. This means you'll only get 1 football for every 1 sheet of paper. You can also add 2 to 3 sheets of paper to thicken your paper football. Do not flick the paper football at other people's eyes.